Correct Wheel Sizes, PCD, Offset, Rims and Tire specs for Toyota FJ Cruiser series. 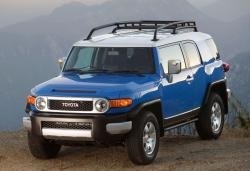 I am wanting to put a set of 16" rims that are 10" wide with an -25mm offset on my stock 2010 FJ Cruiser. Will those work without altering anything? Will there be an issue with fitting 17x8 and -13 offset steelies to my fj on stock suspension? i want to put 305/70/r16x7.5 ET15 tires to my 2008 stock fj. should i change the rim offset and if so what is the best choice? Will this size wheel fit my FJ Cruiser with no problem? Hi, Gaden,can you show your stock tire size ?The tires size you when you brought.I can use tire calculator to compare these two tires and confirm it for you. Hi,Gaden,What your current tire size? I have 285 70 17s on my stock 2007 FJ and they fit fine with no rubbing, even when offroading. 2007 fj 3 inch lift, wanting to put 16" rims and 265 tires on. wanting to stick out 2 inches to get a wider stance. what offset and back spacing would be used for rim? and/or to get any wider stance? thank you! I am running 285/70 r Goodyear fierce attitude tires with no problem. I want to change to 285/55 r20 with 20x9rims.. What offset should I be looking for.. No lift kit. and non TRD version. I have a 2015 FJ cruiser and i want to put 285/70/17 muddies. I have no lift kit. What size wheels will work and do i need an offset to the wheels ? Hi,Rod,The stock wheel size for your car is 7.5Jx17 ET15,bolt pattern is 6*139.7.Stock tire size is 265/70/17.So,285/70/17 is not compatible with the stock tire size,May be you can change to another one.And if you find a 17'' compatible tires,like 285 width,You can try 17*8.0/17*8.5 rims. and plan on fitting them with 285/70/R17 tires. Will this work? I am hoping for a wider more aggressive stance as well without having to use spacers. Hi, Jeremy,For tires,It is compatible with your current tire.For rims of link,the offset is little too low.The stock rims offset is 15mm.You may use spacers. Hi! Can I use a 17inch rims 12 J with offset ET-80, and with tire 285/ 70/ 17 on my FJ, with no lift? Thanks in advance. Hi,Andy,The offset -80 is not a normal data,You'd better confirm again. Hi,Adam,What the car year of that fj cruiser? Hi,Yoshikuni Ikeda,What your current tire and wheel size?I can help you confirm it. I have just purchased a 2012 Fj with 275/60/20 not sure if it’s been lifted . The front tyres rub on the upper control arm on full turn ,but not only that when wheels are straight they are so close to the control arm is this dangerous ?